When a co-worker brought in a Morning Glory Muffin, the aroma just permeated the office. It smelled AMAZING! I had never heard of Morning Glory Muffins, so I tried looking into its history. Surprisingly, I couldn’t find much concrete information, but the muffin dates back to the 1970’s. Former chef of the Morning Glory Cafe in Nantucket, Pam McKinstry is reported to have invented the recipe and subsequently submitted it to Gourmet Magazine where it was published in 1981. And that recipe lives on. Containing a mixture of both fruits and vegetables, you’d expect a heavy muffin. At least I did. But it was amazingly light and fluffy. And flavorful! I found that the muffins are even better the next day. I had refrigerated them because they are quite moist and I wanted them to last. But the next day I microwaved one for a few seconds, spread a little Earth Balance Buttery Spread on them and WOW! The flavors really come to life. There are a few variations on this recipe, but we adapated ours from this one at King Arthur Flour. Line a muffin tin with muffins papers. In the bowl of an electric mixer, combine the flour, sugar, baking soda, spices, and salt. Add the grated carrots, apple, coconut and nuts. In a small bowl, beat together the flax mixture, oil, vanilla, and orange juice. Drain the raisins and fold them in. Divide the batter evenly amongst the muffin papers. They can be close to full. Bake the muffins for 20-25 minutes, until they are domed in the center and a toothpick inserted comes out clean. Remove from the oven, let cool for 5 minutes in their pan on a rack, then turn out of pans to finish cooling. Wrap any leftovers airtight, and refrigerate. King Arthur Flour states that these can be stored at room temperature for several days; freeze for longer storage. 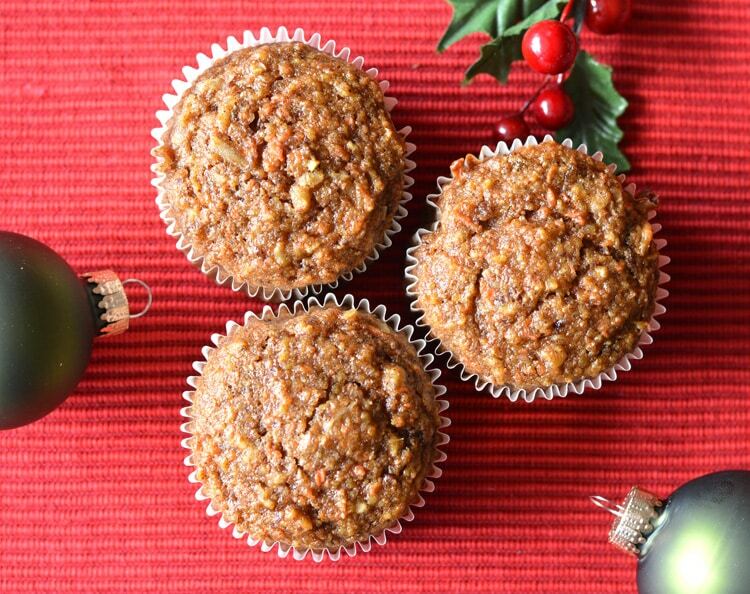 « 50+ Vegan Holiday Recipes, by FindingVegan Bloggers. Roundup! 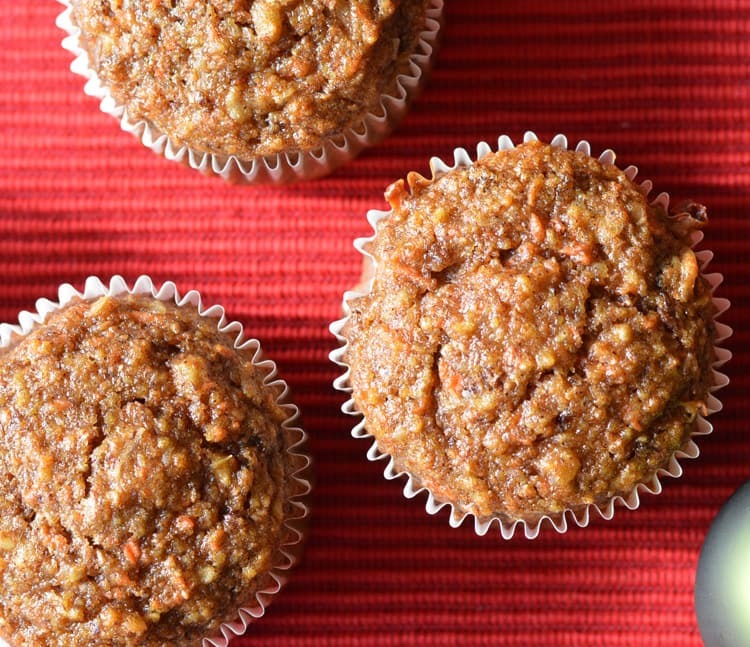 These muffins look incredible and I love all the fruits, veggies, and nuts in them. 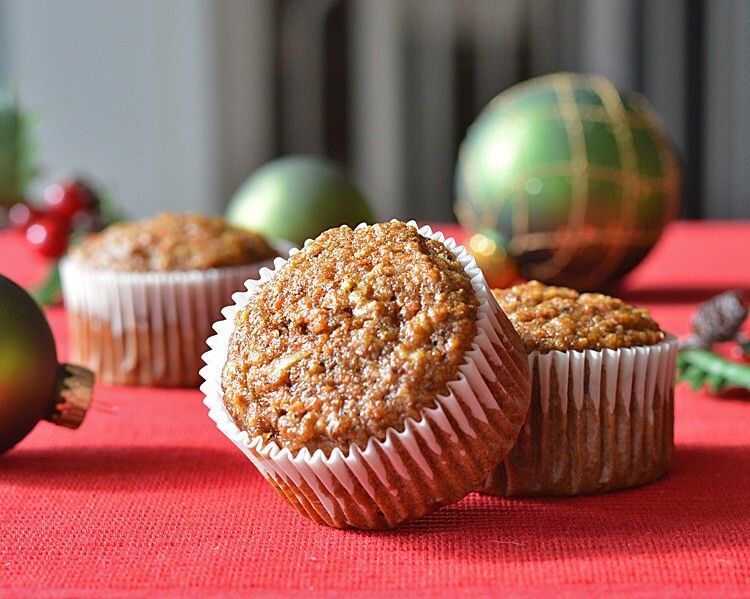 I am a huge fan of next-day muffins too and try to pretend I have enough will power to wait until the next day haha. 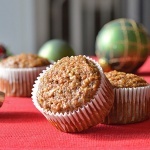 SparkRecipes says there are ~155 calories per muffin, and these sound delicious. I eat whole food, plant based and don’t eat oil: so substituted medjool date paste for the brown sugar & oil, used coconut extract for the coconut and left out the salt & oil. Turned out nicely, very moist and sweet. Took 45-50 min to bake in silicone cupcake shells.